Mercy Lynch is a hard working nurse working at a hospital in Virginia for wounded soldiers. Virginia is part of the Confederate States of America still opposing the North with a Civil War that has stretched on for nearly two decades. The start definitely gives you an appreciation for all the hard work people went through trying to save the lives of the wounded. Mercy soon learns that her husband who fought for the North just died in a Confederate POW camp. Not long after she receives a letter from her father--long thought dead--to visit him in Seattle where he is on death's doorstep. She heads out alone leaving behind all she knows. And so ensures a memorable journey that shows off the weapons of war created in this steampunked alternative past. 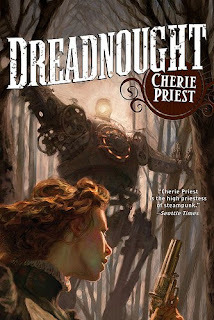 Dreadnought shows much of the America that Priest envisioned with Boneshaker. We travel from Virgina across North America to Washington Territory by foot and river boat to airship and train. Much of the time in the South is cut short so only some glimpses of places are had, but the story does show how fractured the country still is because of the war. Even amid all the world-building and scenery of Dreadnought, Priest proves she still excels with creating believable characters you want to root for with her powerful, independent, and strong willed women always being the stand outs. Priest is creating quite a cadre of strong-willed women willing to do almost anything to accomplish their goal. Mercy is perhaps her masterpiece to date as she faces down all perils and takes aback men merely with the look from her steely eyes and nursing abilities. Also, always remember every good Southern girl knows how to shoot a gun. Mercy often runs into a certain Texan Ranger named Horatio Korman. His entrances gives light to the happenings of the still independent Texas. Korman is everything a seasoned Ranger should be. Straight, strong, and wily and I immediately took a strong liking for him. The mad scientist was a bit of a disappointment. He just never seemed to be effectual or very dangerous. It could be he was outdone by the war machines and a surprise later in the story though. Dreadnought is the literary equivalent of what Will Smith's Wild Wild West could have been only with better characters and more believable action. The center piece of the story is the titular train the Dreadnought, which Mercy can't seem to get away from no matter how far she travels. This train is a character unto itself. You can feel the train fighting back during the battles more so than some of the soldiers it transports. This behemoth of a train feasts upon amour and is equipped more heavily than today's Tanks. You haven't read anything like Priest's train battles. Dreadnought is one wild time. My advice: sit back and enjoy the ride while it lasts. Dreadnought is a shouldn't miss read whether you are a fan of Steampunk or not. I give Dreadnought 8.5 out of 10 hats. There are some very satisfying moments in the end, which help to give closure to fans of Boneshaker that would be worth the read alone. There were also a lot of expected moments at the end, which ended up giving you a knowing smile on your face despite seeing them coming. The tension while not as prevalent as in Boneshaker still delivers thrills and entertainment you won't want to stop. I look forward to all the future stories in The Clockwork Century that Priest gives us. It would be a travesty if we didn't get to see the Texas Ranger Horatio Korman in another story someday. We have at least two more novels set in this world to look forward to including next years Ganymede and Inexplicable in 2012. Lastly, I wanted a quick word on the cover. The top version is the final used on the print edition, but I prefer the version below used on the review copy I got from BEA, which shows the train and Mercy looking quite determined. 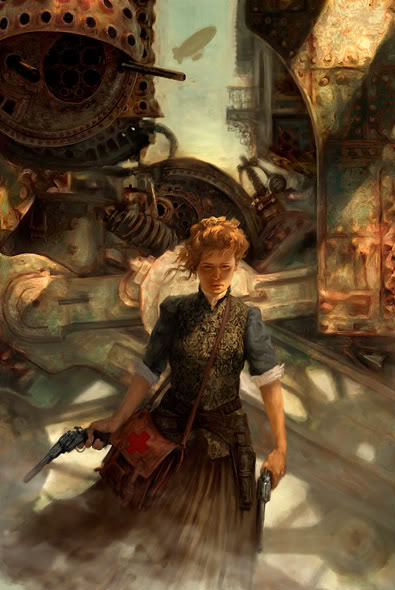 Jon Foster did both pieces quite well, but the below is much more appropriate to the story and character focused work. i actually liked wild wild west. have you read kh koehler's ace of spades? you may like it too. Boneshaker was horrible. I will not be picking this up. Is there another whiny sounding afterword in this book too? I agree. I like the ARC cover better than the published version. And it did remind me of Wild Wild West too!